Use Your Puzzle-Solving Skills to Win Battles within the Darkest of Dungeons! The time is now. Gather your wits, take a deep breath, and step into that dark cavern. The journey will be dangerous. There are all manner of deadly monsters lurking within its depths. You might even be walking into your own grave. However, there are also many treasures to find that, should you actually uncover them, could make you richer and more powerful than your wildest dreams. If you want to get them and come home alive, you’ll need to use your brain considerably more often than the brawn of your sword-arm. Is this another entry to Dungeons & Dragons? Absolutely not! 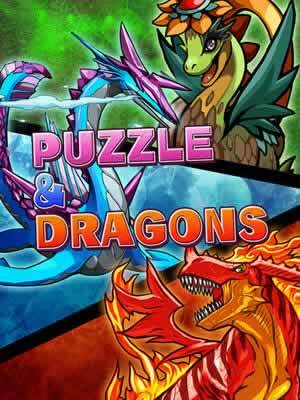 This is Puzzle & Dragons! Combining the elements of addictive puzzle games with popular Japanese RPGs like Pokemon, Final Fantasy, Dragon Quest, and Shin Megami Tensei, the game will test both your puzzle-solving and tactical abilities. Recruit a team of monsters and pit them into battles where your puzzle-solving skills will mean the difference between victory and defeat. Watch your pets evolve over time, acquire more for your roster, or create all new ones. Puzzle & Dragons is an adventure in and of itself; it’s totally unexpected and there’s a lot to discover! What would we do without monsters? Not a whole lot in Puzzle & Dragons. Monsters are your bread and butter, the means to your ends, and your main fighting force. You will need them to accompany you into the dungeons to take down whatever malevolent forces stand in your way. There are many monsters to find, many ways to acquire them, and many ways to improve their strength. Putting the right team together will be vital to your success in Puzzle & Dragons, so gather every creature you can and experiment with them to see which ones will work right for you. Gather over 400 different monsters, including a variety of dragons, fairies, demons, plant creatures and more. Includes iconic creatures from other popular RPG series, such as the Slime from Dragon Quest or the Tonberry from Final Fantasy. Form a team of up to six monsters. Collect eggs from the dungeons and hatch them at home to add new monsters to your roster. 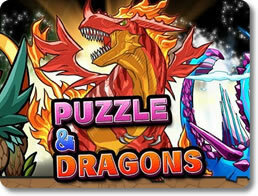 Fuse monsters together to create newer, rarer and more powerful creatures. Win battles to improve your monsters’ abilities. Gain enough victories to have them evolve into more powerful forms. Like most RPGs, combat is a way of life in Puzzle & Dragons. However, it works much differently than the rest. Instead of issuing out commands for your monsters to follow, combat will unfold based on how well you can solve the puzzles that come before you. You have to think both logically and tactically in how to go about them, for every move you make determines how well your little pets will fight. Swap runes around to match at least three together. Runes represent the five elements: fire, water, light, darkness and earth. Which tiles you match together and how many you use will determine what attacks your monsters will execute and how powerful they will be. Match several groups together to chain powerful combination attacks. Monsters have different abilities and are aligned to different elements. Match heart runes together to restore your health. Match wisely; hearts can be terribly rare. Enemies have a variety of attributes and are more vulnerable to some elements than others. Use attacks that will devastate them and refrain from those that they will resist. 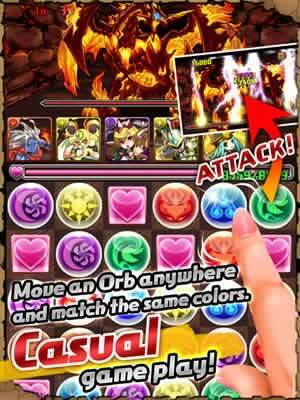 The world of Puzzle & Dragons is indeed a dangerous place, but you don’t need to take it on alone. By going online and working together with your fellow dungeon-diving players, you can make the journey that much easier for both you and your monsters. Get a Helper monster from another player. He or she can help round out your team, give you some extra firepower, or provide an element you just might be lacking. Make a list of friends so you can get easy access to their monsters. Experiment with rare creatures you can’t otherwise get a hold of easily. Use Helper monsters to acquire Pal Points, which you can use to purchase new monsters. Will You Accept Your Quest? Anyone who wants to experience something a little more unique and unusual for their mobile device should seriously consider giving Puzzle & Dragons a look. It does the impossible and mixes the puzzle and RPG genres so seamlessly that it creates something completely new altogether. It’s also astonishingly addictive; no matter how much you play, there’s always one more battle to fight, one more egg to collect, and one more new monster to find in your travels. Pick Puzzle & Dragons up and see what’s been rocking the Asian continent! How Puzzle & Dragons Makes Millions Every Day (Infographic) - Did you know that the company behind Puzzle & Dragons makes millions of dollars every day from this game? How do they do it? Check out our infographic to see how!